The U.S. government collected more than $10 billion dollars last year from congressionally mandated royalties, from leases of public land for the drilling and mining of oil and other minerals. Of late, royalties have garnered increasing attention because of seeming lapses or irregularities in companies’ payments for offshore leases for oil and gas extraction — all underscored by worries about future payments going uncollected due to past enacted royalty protection laws. Rep. Darrell Issa (R-Calif.) spoke to reporters on March 1 after a House Energy and Resources Subcommittee hearing to investigate allegations that the Minerals Management Service had not been correctly collecting royalties on oil and gas revenues. 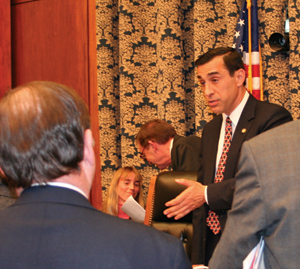 Photo by Frederick Hill; courtesy of the office of Rep. Darrell Issa. When oil and gas companies purchase leases from the federal government, they are required to pay a percentage of their revenues in royalties (as calculated by each company), depending on where a lease is located. Offshore oil leases in shallow water, for example, garner royalties of 16 percent, and deeper water levies are less, depending on the production of the wells and other factors. Such leases fall under the jurisdiction of the Bureau of Land Management and the Minerals Management Service (MMS), in the Department of the Interior. Royalties in the United States “are kind of like a gasoline tax,” says David Steele, a former president of Chevron-Latin America and now the dean of the Florida Institute of Technology’s business school. “It’s fixed,” as opposed to the variability in royalties imposed on companies operating elsewhere, for example, in Venezuela, which just increased required royalty payments despite operating agreements already in place (see Geotimes, March 2006). But the U.S. government still benefits, even though the royalty percentage may remain fixed in the United States, Steele says: As crude oil prices increase, U.S. government royalties increase, and U.S. companies still have to pay taxes on their profits. Yet despite increased profits while prices of oil and natural gas have skyrocketed, particularly after shortages induced by hurricanes Katrina and Rita, critics have noted that companies in the industry do not seem to be paying more royalties. Indeed, oil and gas royalties had been undercollected, according to accusations leveled at MMS by The New York Times on Feb. 14. But those calculations were wrong, said Walter Cruickshank, director of MMS, before the House Subcommittee on Energy and Resources on March 1, with other factors in the mix that account for the seeming shortfall. For example, Cruickshank said, a discrepancy of $700 million of the uncollected sums found by The New York Times could be due to a time lag in the data posted online by MMS. Because companies have a window of six years to correct the amount of oil that they have sold and profits earned, the data may vary until the window has passed. Another small part of the perceived discrepancies may come from “oil-in-kind” royalties, Cruickshank said, for which the government takes the actual product to sell on the market directly rather than taking monies earned. He noted that this practice also accounts for a noticeable decrease in the number of investigators and other officers sent to enforce royalty payments. Other possible losses, Cruickshank said, came from Rocky Mountain natural gas leases, which experienced lower revenues due to low market prices and lack of pipeline capacity. Over five years, the average difference of $1 less per billion cubic feet would have amounted to $14.4 million less in royalty collections for 2005, which also saw drop-offs from delayed royalty reporting because of payment systems lost in New Orleans during the damaging 2005 hurricane season. Cruickshank said that September and November payments amounting to around $60 million eventually were submitted in 2006 and should close some of the gap. Still, according to MMS number crunching, a large amount of past and future royalty money was likely lost because of a mistake with regard to leases purchased in 1998 and 1999, Cruickshank testified. MMS employees who drafted the leases at the time dropped the royalties requirement, forging more than 1,000 agreements that will remain royalty-free no matter what, over their 85-year lifespans. The language — and required royalties — reappeared in subsequent leases. But MMS has collected royalties accurately otherwise, the MMS director said. Darryl Issa (R-Calif.) convened the March 1 hearing because of concerns raised by the accusations from The New York Times, and instead found that what he called “a word processing error” may have been responsible for even more lost in royalties paid to the federal government than the numbers calculated in February. He officially requested a Department of the Interior investigation the following week, but in the end was more concerned about future losses of revenue. Indeed, underlying the discussion was the larger issue of “royalty relief,” laid out by the Deep Water Royalties Relief Act of 1980, which allows companies to avoid paying royalties if market prices for commodities do not reach a certain price ceiling. More than $7 billion potentially could go uncollected under current royalty relief rules. Issa and his colleagues voiced concerns over that loss, and the possible necessity of passing legislation to halt it in the future. Meanwhile, MMS is facing lawsuits by Kerr McGee and other companies that are protesting the government’s right to impose royalty payments on deepwater operations in the Gulf of Mexico, saying that MMS denied the companies royalty relief from 1996 to 2000. That lawsuit could cost the federal government hundreds of millions of dollars. “Clearly [there is] a lot of money at stake here, not just $500 million looking backwards,” Cruickshank testified. MMS is “going to vigorously defend our ability to have price thresholds,” to collect oil royalties when prices are high. William E. Brooks, the U.S. Geological Survey mercury commodity specialist, has compiled the following information on mercury, a commodity still widely used in industrial and mining applications. The ore of mercury, cinnabar, is soft and dark red, and native mercury is one of a few metals that is liquid at room temperatures. Cinnabar from Almaden, Spain, the world’s oldest producing mercury mine, was used during Roman times, and the chemical symbol for mercury (Hg) is from “hydrargyrum,” from the Greek word meaning liquid silver. Cinnabar and mercury are associated with some hydrothermal mineral deposits and occur in fine-grained or sedimentary and volcanic rocks near hot springs or volcanic centers. Mercury may be recovered as a byproduct of processing copper, gold, lead-zinc or silver. Mercury amalgamates readily with silver and gold and, since Roman times, has been used for artisanal or small-scale gold mining in many parts of the world. Mercury from Almaden was used for Spanish colonial gold and silver processing in the New World, and the cinnabar deposits at Huancavelica, Peru, provided a regional source for this important metal. Since 1927, in conformance with the system used at Almaden, the “flask” has been the unique unit for measuring and pricing mercury. One flask weighs 34.5 kilograms, and 29 flasks comprise 1 metric ton. Although mercury occurs widely in the United States, it has not been mined as a principal commodity since 1992. Domestic mercury is either produced as a byproduct of gold mining or is reclaimed and recycled from automobile convenience switches, batteries, computers, dental amalgam, fluorescent lamps, gym flooring, medical devices or thermostats. Tons of mercury-containing waste go into landfills in the United States and Canada. In 2005, the U.S. reserve base of mercury of 7,000 metric tons composed an estimated 3 percent of the world reserve base, and the Defense National Stockpile has 4,436 metric tons of mercury in inventory; however, sales from the stockpile have been suspended. U.S. exports of mercury were estimated to be 278 metric tons in 2004. U.S. manufacturers used 500 to 600 metric tons per year of recycled and imported mercury in the early 1990s. Now, the amount used is estimated to be less than 200 metric tons per year. Analysts must estimate much of the data on mercury because it is a low-volume commodity that lacks careful tracking of its production, use and disposal. Prices and volumes of mercury used may change dramatically from year to year. For example, the average U.S. domestic price of mercury was $150 per flask from 2000 to 2003, but rose sharply in 2004, peaking at $850 per flask in the spring of 2005 before falling to $700 per flask by year-end. Mercury has a long history of use for industrial, medical and mining applications; however, because of its effect on human health, its continued use is in question. Non-mercury substitutes are available. For example, digital thermometers substitute for mercury thermometers, and ceramic material substitutes for dental amalgam. Increased reclamation and recycling of byproduct mercury from mining and metals processing and from used mercury-containing products will reduce risks to the environment. For more information on mercury and other mineral resources, visit minerals.usgs.gov/minerals.